carriewriterblog: Can You Use a Marketing Mistake as an Opportunity? Yes. 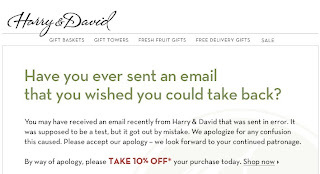 Can You Use a Marketing Mistake as an Opportunity? Yes. 3. Use the incident as a marketing opportunity to offer 10%, thereby possibly making more profit then if the event hadn't ever happened. As a consumer, this didn't bother me, since I happen to know that their prices are pretty good, as well as their products, and I have ordered from them before. 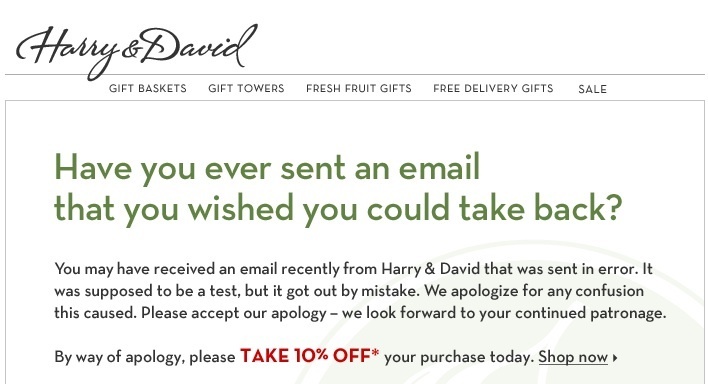 Harry and David are smart marketers and you can be too. No one's perfect, so if and when you do make a mistake, do what's needed to correct the problem as soon as possible, and offer the customer a nice bonus for hanging in there. It's a win-win situation all around. Time to run and take a taste of the Harry and David "Moose Munch" I happened to have just picked up at Costco last week. Coincidence?